After a long walk with my dogs, I just had to make another doggy card. So I picked my sweet sentiment from "Prickley Pear" stamps and my beloved dogs stamp set from Katzelkraft and made a simple card from my scrap stash. I have to say that my scrap stash is humongous and I really need to downsize it. 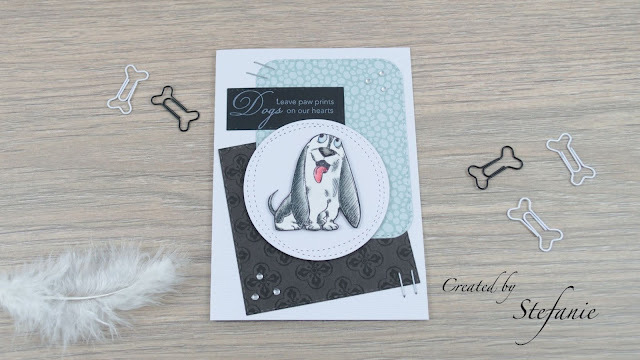 So what better way than this :) As this is a completely doggy related card, I enter the Crafty Animals Challenge, the all creatures challenge from Crafty Cardmakers and the animals challenge from Papercraft. The Katzelkraft doggy is coloured with my Derwent pencils and got some glossy accents on ears, nose and tong. I know that the bassets hounds are mostly brown with (sometimes a bit more black) and mostly white, but the black one looked more fitting on my colour combination of the card. I used some staples and rhinestones to add some bling but not too much and finished this card in no time. quick and easy. I love those cards. You have coloured this image beautifully and it's a lovely card. 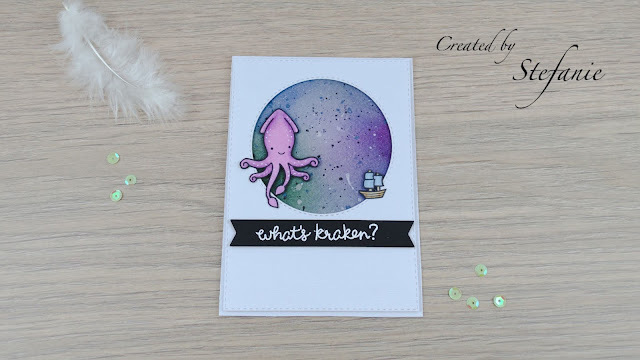 Thank you for sharing it with us at Crafty Cardmakers this time. so lovely! Thanks for joining us at papercraft-challenges!